Hello and welcome to my web site! I am a studio ceramicist based in Southern New England making handcrafted functional pottery and sculptural forms for the home and table. After pursuing a corporate career since college, I'm happily fulfilling a dream that started my senior year in college when I first touched clay. After much time spent in office meetings and sitting behind a desk dreaming of workin with clay one day, 'm happy to finally be doing it. Feel free to have a look around my website portfolio and contact me with any questions you may have. I will have an online store opening soon. Beauty in a piece of pottery is in its' form and surface design, as well as its' functionality. ﻿ The idea that our ancestors originally made vessels of clay as a way to bring together families and communities, to cook and celebrate with, shelter and illustrate with, resonates with me. I enjoy making pottery that will connect with someone on a sensory level. Making pottery that will someday find its' place in someone's home is my goal. In my work you will find attention to detail, finish work, clean lines and soft edges. It's my hope that my ceramic work invites someone to want to see, feel, touch and use to brighten their home and everyday life. Functional elegance drives my work. After growing up in Colorado surrounded by the sunny Rocky Mountains, one day I decided to leave my secure corporate job to live by the ocean. Soon after I transferred my creative talents to clay-a dream that has been with me since my first wheel throwing class the end of my senior year in college. Both the strength of the Rocky Mountains and the movement of the ocean influence my work. Simple, elegant beauty and function found in the natural environment inspires my process. ﻿I'm drawn to softly defined contour lines and textures seen in every day life. Organic forms such as a leaf, sand, water movement and flow, a shell, flowers, and sea life, to name a few, seem to catch my eye often. Functional elegance drives my work. Follow my InstaGram Account Photo Gallery @GinaRubinDesign. Thank you for supporting my work and following my clay journey! Hand built functional and sculptural forms in stoneware and porcelain. Wheel thrown functional pottery in stoneware and porcelain. All work is high fired and only non-toxic, food safe glazes are used. Dishwasher safe, though gentle hand washing in warm soapy water is suggested. Taking her first wheel throwing class as an elective in college for the first time, Gina fell in love with clay her senior year at University of Northern Colorado. She submitted a ceramic sculpture to the juried student art show that year on a whim and unexpectedly won First Place in Show. 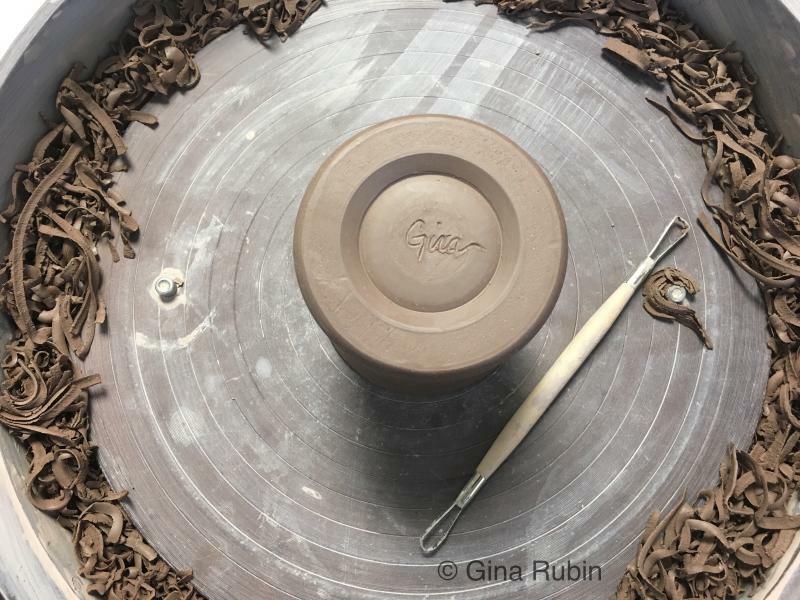 After graduating, Gina pursued a corporate career, graduate education and eventually transferred her creative talents to clay. Gina started throwing pottery in 2014. 2014: Gina was invited late Summer of 2014 to join the Waterford Farmers' Market in Waterford, CT. to sell her pottery. 2015: First art festival exhibition: Madison Arts Festival, Madison CT. and Spectrum Art Gallery in Centerbrook, CT.
2016: First Museum Exhibitions: Mystic Museum of Art (Mystic, CT. "Black & White Show") and Slater Memorial Museum (Norwich, CT. "72nd Annual Connecticut Artist Exhibition"), concurrently. 2017: Published, ArtBeat Magazine: "Mercury Rising Artist". 2018: Awarded Elected Artist Designation, Mystic Museum of Art, Mystic, CT.
2019: Awarded Associate Artist Designation, Connecticut Academy of Fine Arts, CAFA, Mystic, CT.
*Online Store coming soon~ Until then, Gina's work can be found locally in the Slater Memorial Museum Gift Shop in Norwich, CT., the Spectrum Art Gallery in Centerbrook, CT. (online and in the Artisan Store), CT. Mystic Museum of Art Shows in Mystic, CT. Copyright 2017 Gina Rubin Design. All rights reserved.